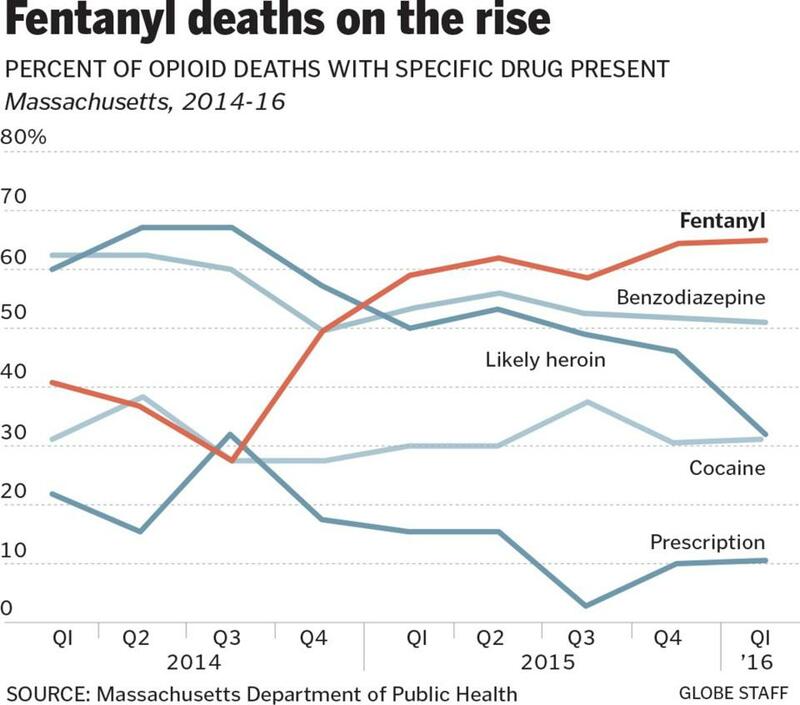 More than ever, the powerful synthetic opioid fentanyl is claiming lives in Massachusetts, fueling an overdose death toll that continues to rise, according to data released Wednesday by the state Department of Public Health. During the first half of 2016, deaths from opioid overdoses were higher than in the same period last year. That happened despite an apparent decline in the use of heroin and prescription drugs. Prescriptions for opioid painkillers were at their lowest level since early 2015, and heroin and prescription drugs were found less frequently in the bloodstreams of overdose victims than in the past. Instead, fentanyl was clearly in wide use. Sixty-six percent of confirmed opioid-related overdose deaths so far in 2016 involved fentanyl, an increase over 2015, when the rate was 57 percent. Fentanyl, the drug that killed musician Prince, is 50 to 100 times more powerful than heroin. Made in laboratories in China and Mexico, it is mixed with heroin or sold to unwitting buyers who think they’re getting heroin or painkiller pills. Fentanyl is so dangerous that last month, the US Drug Enforcement Administration warned law enforcement officers that they could die if they handle or inhale it. The number of seized drug samples nationally containing fentanyl increased by a factor of 38 since 2004, with the biggest increase starting in 2014, according to the DEA. In Massachusetts, emergency medical services are finding they often have to provide more than one dose of the overdose-reversing medication naloxone, a sign of fentanyl’s potency and prevalence. On average, they used naloxone — widely known by its trademark name, Narcan — 1.4 times per overdose in the first quarter of 2016, according to the new state data. Trips by emergency crews responding to opioid episodes nearly doubled between 2013 and 2015. “As this report details, the prevalence of fentanyl increases the lethality of overdoses,” Marylou Sudders, the state’s secretary of health and human services, said in a statement. The state needs to continue to invest in treatment, said Kurt A. Isaacson, chief executive of Spectrum Health Systems, a large addiction-treatment provider. But prevention is also essential and that should start with education at early ages, he said. “If we have not had the discussion with students before they enter middle school, we’ve lost them,” he said. Opioid addiction has been a top concern of Governor Charlie Baker’s administration. The 1,531 confirmed opioid overdoses in 2015 represented an 18 percent increase over 2014, and the 1,294 deaths in 2014 were up 41 percent over the previous year. In the first half of 2016, the state confirmed 488 deaths and estimates the total for the first half of the year could reach nearly 1,000 after investigations are complete. The Baker administration’s efforts have included increasing treatment beds, making naloxone more affordable and accessible through a bulk-purchasing program, and encouraging medical and dental schools to redesign curriculums to better emphasize addiction and appropriate opioid prescribing. Isaacson said he was not surprised to see overdose deaths continue to rise despite the focus on opioids. Many of the new efforts have been in place for only a few months. “It takes a while for that to have an effect,” he said. But the data do reveal one important change: a reduction in opioid prescribing amid growing awareness that the drugs had become too widely available. Many people started on the road to addiction by taking pills such as Percocet or Vicodin, usually prescribed for someone else and stolen or shared. In the first quarter of 2015, more than 390,000 individuals in Massachusetts received one or more prescriptions for opioid painkillers. By the second quarter of 2016, that had dropped by 16 percent, to 330,000 people. Notably, during the same period, the number of people who received prescriptions from four doctors or pharmacies — a sign of abuse — was cut in half.